This weekend is the Biennial CDKL5 conference taking place in Denver, Colorado. From the looks of my Facebook feed and the parent support page, the majority of our CDKL5 family will be present. This is the second conference to take place since we have known of Sonzee's diagnosis and the second conference we will miss. The obvious reason is because the weekend has coincided with our second weekend in New York both times, but if I am honest, the more psychological reasoning is a bit deeper in nature. I would be lying if I said I wasn't a bit envious of everyone who is there. A part of me that is sitting here in New York aching to meet all of my virtual family in person and to meet the children and siblings who went with their families. There is a big part of me who would love Sonzee to be around children who are the most like her, just in case there are times she may feel like she is the "only one". There is a piece of me wondering if I went if this would be the mom group that I would finally feel like I fit in most with. Despite my envy of those at the conference, there is a significant portion of me that is not ready to be in the room with so many parents whose children also suffer from the effects of a CDKL5 deficiency. I cannot physically see so many impacted children, in what would feel to me, a small confined space. It breaks my heart that this is all of our reality, that such a debilitating deficiency exists. I just will not ever understand and maybe avoidance is my way of dealing, because I realize more and more every day, I am still unable, incapable, and unwilling to fully accept the diagnosis. It is the night before the first day of camp. My kids excitedly packed their bags as soon as they each got out of the shower before dinner. I am used to doing this act myself, and while the Type A part of me cringed letting them throw everything haphazardly into their bags, I took a deep breath and just observed. I couldn't keep up with their excitement as I was ensuring they each packed their own sunscreens, goggles, towels, and every other item they will need in their backpacks. I was glancing over the "camphouse" items for Sonzee's bigger sister and trying not to think about the fact that tomorrow should be Sonzee's first day of camp as well. I know that Sonzee was able to experience Friendship Circle camp in May, but that is not the camp experience I am mourning tonight. I found my mind drifting off into the distance, to a life that is not mine; what I would refer to as my alter-reality. It was there I was packing a 4th backpack with two bathing suits and two towels. Sadly even in my fictitious reality I have no idea what backpack Sonzee would be sporting or what bathing suit style she would prefer. I think the saddest part of this daydream is that I cannot imagine anything about who Sonzee would have been had she been the typical child we anticipated. It almost makes me more angry that I cannot even mourn properly, because this deficiency has taken away everything that I should know about my 3 year old. I am left simply guessing and insinuating about her personality and preferences, but the truth is, she is unable to tell me specifics so even my dreams leave me anxious about the potential disservice I am causing. There are nights like tonight where I wish Sonzee's CDKL5 deficiency did not exist. Where we were just a boring, typical family with no obvious outward struggles and I didn't know anything about CDKL5, childhood epilepsy, or have any significant first hand knowledge about a profound developmental disability. While this is and always will be the path our family must travel, there is still a significant part of my mind that is traveling an imaginary parallel journey filled with the "could haves", "would haves", and "should haves". Last Thursday we boarded the plane for summer 2018 in New York. This is our family's 3rd consecutive year and 4th year in general that we we will be spending the summer in the Catskills. Every year when the summer ends I eagerly await its return, because there is just something about this place. A change from the hustle and bustle of our typical, crazy, everyday life. The mountain air, gorgeous scenery, and lack of doctors offices and hospitals gives me enough fuel to keep me going through the rest of the year. Then when summer rolls around, we gamble that Sonzee will behave and we won't have to visit any doctors or hospitals. For the most part we have been lucky, and even though inevitably our luck will run out soon, the trade off will always be worth it. We have been here 3 days and I already feel like time is going by way too quickly. My list of "To-Do's" and prospective achievements for Sonzee are lengthy, and as usual despite the lack of scheduled activities, it does not appear that any of it will be completed. No matter that we changed scenery, my brain never leaves the chaos and world of CDKL5. There are medical letters of necessity that need to be written, prescriptions that need to be filled, questionnaires and studies that need to be started and finished. We just can't seem to escape what comes with the life of CDKL5 Deficiency Disorder. Yet, the thing about being in the mountains, during the summer, with the entire family is that all of my long lists of To-Do's tend to get pushed off, and I am partially okay with that. When our daughter had her first seizure it was not in a way I would have thought a seizure would look like. It was subtle, quick, and questionable. I honestly wonder how many seizures in her first days I missed, or how many I saw but attributed to something else. I often wonder if I felt them in utero, or if her first one occurred right after birth. In hindsight, the "wonky eye movement" we saw, that was attributed to just being "weird baby" have become her trademark. So many times her simple eye roll will be missed by those who are unfamiliar with her, and to be honest even those who know her extremely well can still miss these types, or just think she is being sassy. They are so fast that epileptologists who are not her own have missed them on an EEG. They happen when you turn your head to pick something up, when you blink, when you open the fridge, or when you rub your eyes. They are less than a second and look benign. So many times when I point out a seizure to someone who has just met Sonzee the responses are always the same, "Oh wow, I never would have known that was seizure" and "How did you know that was a seizure?" The worst part about her trademark eye rolls are that they are just as devastating to her brain as her other types. They tend to occur in clusters, seconds apart, and for lengthy periods of time. They are the most difficult type for us to stop. It is this type that resulted in a call to 911, multiple rescue medications, and at the time a new to her fancy diagnosis of "non-convulsive status epilepticus". Before 2015 I had never thought about seizures much less known anything significant about how they might present. 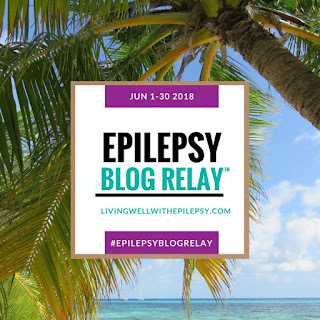 Our family has now seen so many various presentations of seizures that our family is quite proficient in identifying most (if not all) types of seizure activity. It is amazing that our 5, 6, and 8 year old can tell you the intricacies of different types of seizures. What is so important to know about seizures is that they are not always obvious and they are not what you might envision. One of Sonzee's CDKL5 sister's mom created the image above. I saw it circulate in our parent support page about 4 days ago and to be honest I kept scrolling. I am unsure what deep rooted psychological reason it might be due to, but the "easy" answer is just that it seemed almost unheard of to believe 2 children a week could possibly be diagnosed with CDKL5. It is rare after all, that number makes it feel much, much, much more common. I let the image go out of my mind for a bit, and then Friday afternoon I reached out to the mom and asked her more about the statistic. She directed me to the CDKL5 UK FAQ page and then I reached out to another parent for confirmation. 1 in 46,000. 1 in 46,000, the amount of innocent children, and by default, their families end up learning the ins and outs of living life with a CDKL5 Deficiency Disorder. This is based on a reliable testing agency in Europe that estimates incidence. To be honest after I learned this, it just made me angry. Why is this number as high as it is? De Novo mutations are the main kind of CDKL5 mutations, meaning that while genetic, neither mother nor father has the mutation themselves and so "no one is responsible", yet 1 in 46,000 times this is estimated to occur. Do not get me wrong, 1 in 46,000 is still considered "rare", and for comparison sake, the incidence of Rett Syndrome is 1 in 10,000, but welcoming an average of two new families a week to our CDKL5 family just hurts my heart. Today, like every June 17 of Sonzee's life I will give homage to this day. It is bitter sweet as I am grateful we have a designated day due to the advances of science, but angry that such a day even has to exist. This year, our day of awareness coincides with Father's Day in America, and for the first time since 2015, I have not told my kids that today is awareness day. We spend every day during the year living, breathing, witnessing, and being aware of the effects and impact of CDKL5, so today we will honor Sam and be thankful that Sonzee has an amazing dad and tomorrow we will back to spreading awareness of CDKL5. Over the last couple of weeks Sonzee's baby brother had a massive burst with his skill acquisition. He went from being a little "behind" to right on target with just some little kinks that he will have to iron out as he continues to grow. He is 6.5 months old and he is rolling around and able to sit on his own for increasing lengths of time. He is reaching out for and exploring his toys more often and his personality is shining through. My most and least favorite part of the effects of his current gains is blended into one. Nothing has ever brought me as much joy as the relationships I have watched develop between my children. However, this week nothing hurt quite as much as watching my older kiddos run passed Sonzee after they came home and over to their brother, who was sitting up, so eager to see them with a grin wider than his little face could handle. In one instance I was hit with so many emotions. They smothered him in kisses and hugs while picking up his hands and getting excited with him. After close to a minute of watching them interact, I said from behind the counter, "Did you say hi to Sonzee?" My oldest daughter quickly turned around and went right over to Sonzee and gave her kisses and asked about her day, but the damage was done. I was not upset or mad at my older children, these situations happen. I understand what it is like to be drawn to those toothless smiles, the sweet coos, and the reciprocity of a more typical child. Yet my heart broke for Sonzee. She had to have known. She used to be the one they ran to when they came in the door. Three years into this journey and it amazes me each time I experience something new that brings about the "old" feelings of anger, frustration, sadness, and grief over the loss of what should have been a healthy 4th child. As this journey continues it does not get any easier, but rather the feelings just ebb and flow. Some days the weight is almost unbearable and the pain feels as fresh as it did back in 2015. Then there are times when I am unphased by our situation and "it is what it is". There is no way of knowing what each day will bring, and I wish I knew in advance because more often than not I am just holding on and barely holding on at the same time. I was putting my older girls to bed last night when I decided to ask each of them what they disliked most about CDKL5. The younger one quickly said "the seizures", and after mulling it over a bit the oldest said "it is sad". I first asked the younger one, "why do you dislike the seizures? ", and she replied by putting her hands up, clenching her jaw, and saying "because you look like this". I then asked my oldest, "why is it sad? ", and I was told "because you cannot talk". As I am sitting here I am asking myself the same question and I feel like it is similar to being asked, "would you rather be deaf or blind?". Neither is ideal, both have their challenges, and I would rather none of the above. However, if I had to choose what I dislike most about Sonzee's CDKL5 mutation my answer would be that she is trapped. On Monday evening I received an email from one of Sonzee's doctors suggesting we put her back on the pain medication, gabapentin, at a higher dose than last time to help with the visceral hyperalgesia. What if she doesn't even have stomach or intestinal pain and I am misinterpreting her vocalizations? What if she is itchy or nauseous? What if she just has a headache or is dizzy from all of the other medications she is on? What if she is just a sassy toddler that cannot get her point across and she wants to be doing something else besides what we think she is wanting to do? If one wish of mine would be granted, I would use it to have a day where Sonya could communicate to me. A day where we could come up with a system for me to learn her specific movements, facial expressions, and vocalizations so that when our day was done I would still be able to understand her wants and needs. I would ask her to tell me how she would prefer to be handled during a seizure and how best we could comfort her when it was over. I would want her to tell me if I have completely missed the mark with my advocating for things I think she wants or my assumptions of her ailments. There is not much else that is worse than the feeling I have in the pit of my stomach of being wrong about me potentially misinterpreting her discomforts and her being unable to tell me I am wrong. 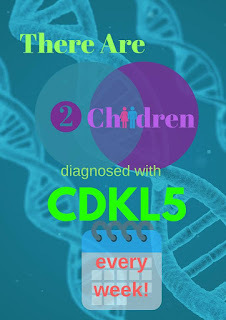 Today marks day 4 of CDKL5 awareness month. It is a month I have been lucky enough to honor over the 3 years of Sonzee's life. The entire month brings similar feelings to that of her diagnosis day; a mixture of gratitude for having an answer to the "why", and pain because of everything that comes with the 5 characters that don't go away when awareness month ends. Historically, I spend each day of this month trying to balance the positives and negatives that have come with this diagnosis, not wanting to highlight only the bad but trying to give the weight of these characters their due justice. The truth is while the hallmark of CDKL5 is early onset, difficult to control seizures, CDKL5 is more than just seizures. Two years ago yesterday Sonzee was finally discharged from a 28 day hospital stay. It was a discharge we were not sure would occur, and the experience left us jolted to the core. It was during that stay that it was clear she would most likely never tolerate feeds into her stomach again, 2 years later and those thoughts are pretty much confirmed. She is still fighting the same battle and we still have yet to figure out how to help her. That sadly seems to be a recurring theme, and it weighs heavily on me as a mother. My job is to not allow her to suffer, and CDKL5 makes that nearly impossible on every level. Sonzee is 3 years and 3.5 months old, yet our 6 month old moves circles around her, almost literally. She cannot sit, she cannot crawl, nor can she walk. I am able to say those words without tears now, and we focus on what makes her happy, but the facts still tug at my heart. I wish for her that she was able to sit, that she was able to crawl so she could get to toys or places she wants, and that she was able to functionally use her hands to request hugs when she wants. I wish for her that her voice was not locked inside her unable to communicate her basic wants and needs. I do not need a month to remind me of everything that having a CDKL5 mutation has taken from Sonzee or our family. I live the effects every hour of every day, and when this dreaded deficiency takes her earthly vessel from us, it will continue to wreak its havoc on those of us who have fallen in love with her over the years. What this month simply does is allow me to reflect on the significance this string of characters has on Sonzee and every child impacted and share the weight so that I do not have to carry it alone.